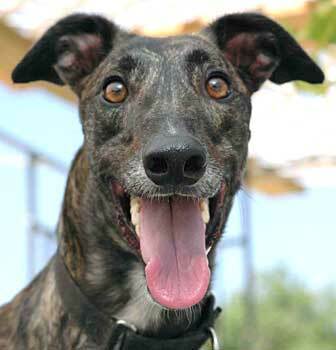 Lakota, aka Hotfoot Lakota, is a fun-loving, dark brindle male. 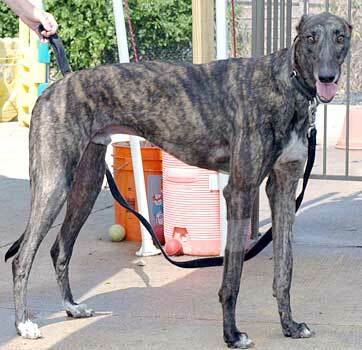 Born on March 11, 2004 to sire, State of the Art, and dam, Oneco Maggie, this 2-year-old never made it to a race track. Working in cahoots with Lenny, the brothers decided early on that toys, wading pools, and human companionship were much more to their liking. A very friendly guy, Lakota is eager to meet his new family and provide a lifetime of smiles and tail wags. He gets along very well with other Greyhounds, but he is not cat tolerant. He has not been exposed to small dogs at this time. 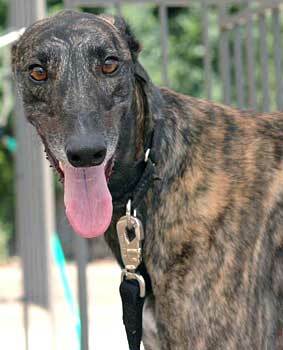 Lakota is a beautiful dark brindle with a thin body. He is learning his manners. Each day seems to be a little better. He is very interested in everything you are doing and will often check out what's in the kitchen by sniffing along the counter tops. Lakota responds to "no" rather well. He is getting much better about bathroom habits and is almost 100% housetrained. Lakota walks on a leash very well. He gets along with everyone and hasn't met a stranger yet. If there's something going on, Lakota wants to be in on it! We don't know how he would be around small children, but he is great around older kids. He acts just like them. Most nights Lakota sleeps all night long. There have been a couple of nights when he has nudged me until I would let him outside. These nights have become fewer as he is quickly getting used to human sleeping habits. He is still an early riser and thinks everyone should be up and running when he is. After being let out however, he is willing to come back in and go back to bed. Lakota is becoming an avid ball player. He enjoys a good game of catch. As a matter of fact he caught on to the game very quickly! He loves to play with his stuffed animals and doesn't mind chewing on a rawhide flip every now and then. We have been able to leave Lakota uncrated for longer and longer periods of time. I actually think he does better left uncrated. Lakota loves life! He really is happy being in a home with people who love and appreciate him! He reminds me of a small child because he seems to look at everything with such awe and amazement! He will make a wonderful addition to any loving home that doesn't mind a little bit of gusto!